Oh my God, you guys — IT’S FINALLY HERE. That’s right, as of TODAY my seventh novel, BONESHAKER is officially available … and I for one could not be happier (as I trust you can gather by the accompanying photo). Go on! Click right here! Note the big green “IN STOCK” status on Amazon.com. And while you’re there, if you haven’t already, I’d like to rather shamelessly ask you to take a chance on it — if you are so inclined. If you’d like to know more about it first, please allow me to point you at this interview over at the Mad Hatter blog. It too went live today; and in this interview I talk a bit about the Clockwork Century universe, the players in it, the hats I like to wear, and at least two things that very few people know about me. For a much more in-depth discussion of this book, this universe, and everything else — visit The Clockwork Century and poke around all you like. There, you’ll find maps, commentary on the philosophy of steampunk, novel summaries, and some enticing reviews. No, really. This one got a starred review from PW, my first truly favorable nod from Kirkus, and friendly words of recommendation from everybody from Mike Mignola to Warren Ellis and Wil Wheaton (all of whom — and everyone else quoted here — I thank from the very bottom of my heart). So. If you have any interest whatsoever in steampunk pulp adventuring, alternate history, dirigibles, pirates, zombies, secret criminal societies, and Bonus! extended deleted scenes from the Civil War, I honestly believe that this book may well be right up your alley. Thank you so much for reading, and thank you so much for picking up this book, if you can be persuaded to do so. And if you feel the urge to repost this information or pass it around — that it might better reach others who might also dig a good steampunk pulp adventure — then please don’t let me stop you. For that matter, if you read an advance copy of this book and enjoyed it enough to tell people about it, I’d be forever grateful if you’d take a moment to share that opinion by blog or by customer review. Anyway. Wow. Yes. Today’s the day, and I’m all out of breath just from the sheer excitement of it. Thanks again, everyone. Times a million or more. Search for an independent bookstore near you. this article BONESHAKER BIRTHDAY FTW! Yay! Congratulations! Boneshaker looks absolutely smashing and I can’t wait ’til my copy gets here (shipped out yesterday from Amazon!)! Sooooo exciteeeed, eek! Getting frustrated! Amazon Canada says it is still on pre-order and so hasn’t shipped. Yet also says today is release date… but still hasn’t shipped. ARGH! Want my book and want it now! Cherie, congratulations – Cory gave you a smashing write-up at BoingBoing!!! Congrats, Cherie. Are there any plans to publish this in e-book format? I would love love love to read it on my Kindle. I am SO excited about this book! I like da way you wrangle dem words, girl. Also, really like the new look here. Very easy on my poor eyes! Thank you and Mad Hatter for thes great interview. 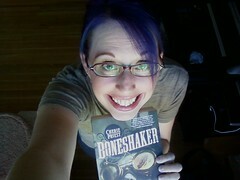 I’m really keen to read BONESHAKER. I sent a pre-order to amazon.de in July. It should be delivered by middle of the September. Today I checked again amazon.de and book depository uk but BONESHAKER isn’t available. IT IS SOOOOOOOO SAD!!!!!! I had this on pre-order at Book Depository (http://www.bookdepository.co.uk/book/9780765318411/Boneshaker) but they’ve cancelled it due to being out of stock. Either the Brits aren’t getting much love regards to volume or it’s sold really really well (or some deals have been happening restricting access to the book for some parties). No interest in ordering from Amazon due to the ridiculous o’seas shipping charges (live in Australia). Book Depository doesn’t charge for shipping. Guess I’ll have to hope it turns up in one of the local book stores & isn’t too overpriced or Book Depository manages to get some stock in. I do hope this is a sign if the book selling really well for you. I ran across mention of your work only yesterday at whatever.com, and after checking out your sights ordered myself a copy of Boneshaker on spec. Not really a genre I’ve sampled in recent years – (though I own just about all of Moorcocks stuff up until the mid nineties and I see you link him loosely to “steampunk”) – but what the hell, goggles – cool!. Regardless of how I like the book I must say you have one hell of an ear for titles-Those Who Went Remain There Still-stunning, poetic and memorable – and critically, enough to make me want to read the book – which has got to be a good thing. Thanks a bunch everybody – I appreciate the support. And to answer some of the questions, check the next post up. I tried to cover pretty much what everyone was asking, both here and on LJ (and via email, too).